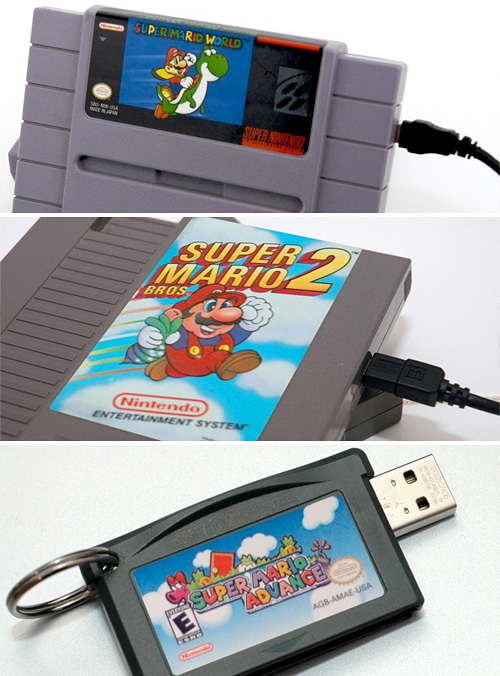 NES, SNES & GBA Cart Hard Drives & Flash Drives | OhGizmo! If you’re a fan of classic gaming, particularly from Nintendo, you’re either going to love or cringe at the site of these cartridges that have been converted into hard drives and USB flash drives. They were created by Etsy seller 8-Bit Memory, and the prices seem to range from about $39.99 for a GBA cart 4GB flash drive, to upwards of $179.99 for a 1TB NES cart external drive. Custom orders are also welcome, if your cart of choice hasn’t already been converted. These are freaking awesome. The flash drive will be mine!!! that 1 TB NES cartridge might actually be worth it, but $40 for a 4GB drive, sorry but the cool factor doesnt justify that cost.